Facebook finally released a native iPad app which works as a universal download for both iPhone and iPad users. As new social networking users are going mobile, many have grown accustomed to checking their Facebook updates on the iPad via Safari or using the Facebook iPhone app in 2x mode. Fortunately, the Facebook app has become available to iPad users. One significant advantage of the native Facebook iPad app is that it makes navigation significantly easier. In the past, it was necessary to use a web browser, such as Safari, in order to access Facebook. Unfortunately, users would often become frustrated attempting to scroll through the site and switch between different features. In particular, the chat feature was nearly impossible to use efficiently without a computer. With the use of the new Facebook for iPad tool, however, a menu bar appears on the side in order to make it incredibly easy to switch between different features, making navigation significantly less tedious. Additionally, the chat feature has been redesigned to be used specifically with the touchscreen keyboard found on mobile devices. 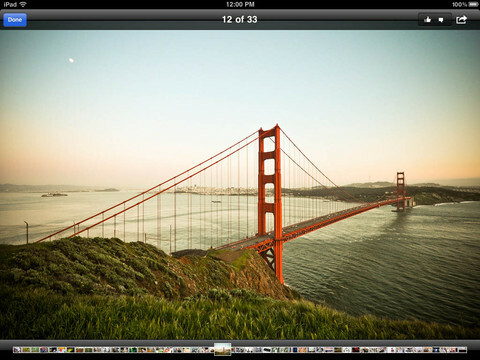 The tool also allows users to switch back and forth between landscape and portrait mode. Along with improved site navigation, the News Feed in the Facebook iPad is significantly easier to use with the help of the tool. Without the tool, the News Feed is difficult to read, and the images are often incredibly small. 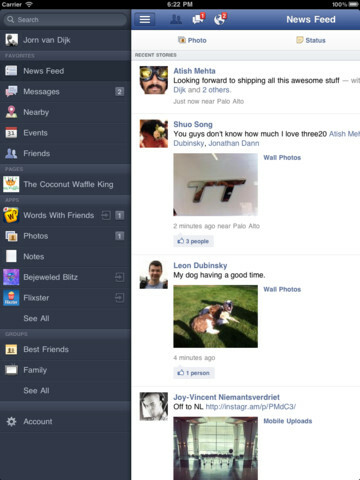 With the use of the tool, however, the News Feed becomes enlarged to take up the whole screen, making it significantly easier to scan through. Additionally, simply clicking on an image will enlarge it dramatically. Also, videos can be played instantly from the News Feed and even sent directly to a television with the use of AirPlay. In addition to the ability to send videos to a television, another feature on the native iPad app is the new Nearby feature. When users activate the Nearby feature, they can view a Google Maps page with all of their friends highlighted at their current locations, which is determined using GPS. This is an incredibly valuable feature for any user who is traveling and wishes to locate friends in the area. Users can then also Checkin to nearby places on the iPad. Although the Facebook iPad app has many positive aspects, one significant disadvantage is that it is unable to use any Facebook apps. Users who rely heavily on versatile apps will need access to an actual computer in order to use them. Additionally, many players who use Facebook primarily for gaming will also be disappointed to find that Facebook games such as Farmville or Mafia Wars cannot be played on mobile devices. Overall, the Facebook iPad app provides a plethora of helpful features that can greatly enhance one’s ability to access Facebook with the use of a mobile device. Not only does this tool eliminate problems using Facebook with Safari, but also adds in new features that can only be accessed on a mobile device. For those who wish to enjoy social networking when a computer is unavailable, one of the most valuable tools available to accomplish this is the Facebook for iPad app. 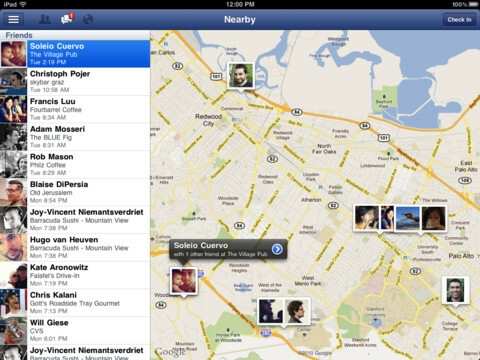 AppSafari review of Facebook for iPad was written by Darius Reimm on October 30th, 2011 and categorized under App Store, iPad apps, Social, Universal. Page viewed 7773 times, 2 so far today. Need help on using these apps? Please read the Help Page.